Alabama played hard, but ultimately fell to 12-7 on the season with the loss in Waco. The team did not arrive until after midnight, which obviously isn't ideal for an 11 a.m. start on the road. We started off slow, falling down by 5 early, but the bench provided a spark and we went on a run to gain a 5 point lead. As would be the story of the game though, we were never able to extend that lead to a comfortable margin. It seemed like every time we had the ball and a two possession lead we would commit some unforced turnovers. We ended up with 13 turnovers in the game, but it felt like a lot more. The last 3 minutes of the first half were an unmitigated disaster. Poor shot selections, dumb fouls, bad turnovers, and a failure block out turned a 29-29 game into a 36-30 halftime deficit. We came out on fire in the second half. 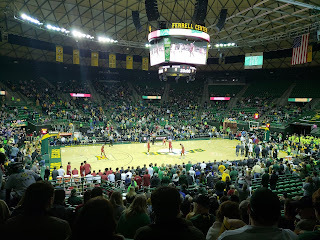 Riley Norris was bombing 3s and Donta and Mack had a great high-low game going that Baylor had no answer for. We started the second half on a 7-0 run to re-take the lead, and the game went back and forth from there. We had several opportunities to extend the lead but either turned the ball over or failed to get stops on defense. Baylor had one stretch where they had dunks on 4 possessions in a row and I think there were 3 other possessions during that span when they made layups. Overall, I think CAJ did a decent job this game. We took advantage of mis-matches offensively and he obviously saw something he could exploit with T-Mack in the high post. That being said, there were some substitutions and lineups that I didn't like, and again I thought we burned our timeouts too early. I felt we left Galin in for Donta for too long when it was obvious that he was struggling to defend the rim. We seemed to lose our composure a bit down the stretch. We had a few questionable calls go against us, but we also benefited from a few as well. The officials were generally letting the guys play, and it was a physical game. One key turn of events came when we burned our last timeout with 2:53 to play and down by only 2. I would have preferred to save that timeout, especially since we had not yet had the under 4 media timeout. Immediately out of that timeout, we got an offensive rebound but Kira's put back attempt was "blocked." It looked to me, and to our bench, as if it was goal tending. I still haven't seen the replay, so I'm just going by what it looked like from my vantage point at the game. At the other end, there was a critical out-of-bounds play that was reviewed and awarded to Baylor. I have no idea what happened on that play as they didn't show that replay at the game either, but the Bears cashed in and went up 4. Next Riley, who had played a great game, makes an ill-advised pass leading to a turnover and another bucket for Baylor, so now it's a 6 point game and that was just too much to overcome. We were out rebounded, but there's no shame in that. Our guys gave all they had going after 50-50 balls, but credit to Baylor for matching our intensity and getting a few bounces to go their way. The difference in the game was their rebounding and our turnovers. You also have to tip your hat to Makai Mason who made some tough, contested shots down the stretch to bail them out of several possessions. Riley made 4 from downtown and was perfect from the field, finishing with 16 points. I thought T-Mack was the player of the game for us, he ended up with 15 points. Kira had a few more turnovers than I would have liked, but had a solid game with 15 points as well. Donta's double-double streak came to an end, but he was a big part of why T-Mack had such a big day and still finished with a solid 11 points and 7 rebounds. Herbert fouled out in just 15 minutes of play and was a huge liability on offense. A lineup of Kira, Petty, Riley, T-Mack, and Donta would have been unstoppable in this game, but we never saw it. 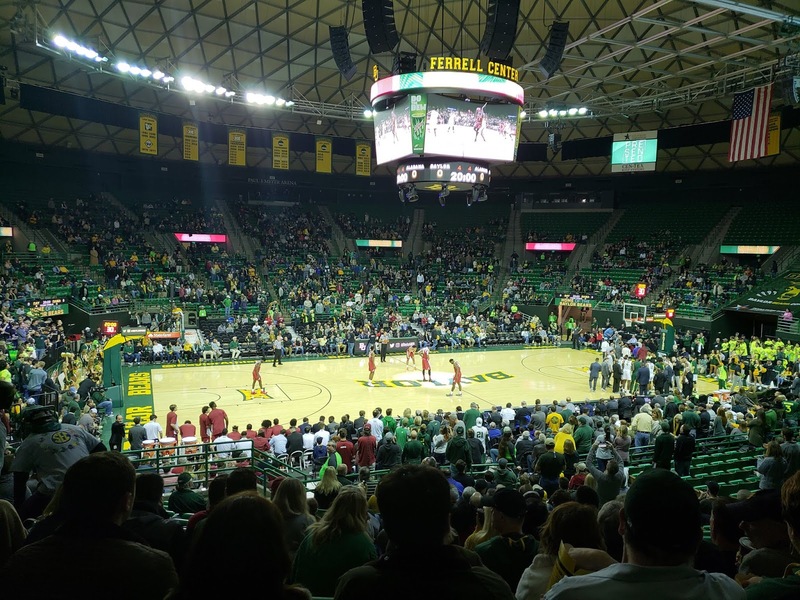 The Ferrell Center holds about 10,500, and I would guess there was no more than 6,000 in attendance. The 11 am tip-off on a cold and rainy morning likely kept a good number of their fans at home. I was really proud of our fan base for representing, we had nearly an entire section and most of another, with more crimson scattered throughout the building. I would guess we had over 700 fans total, and it wasn't just local alumni either. We spoke to several groups who traveled from all over Alabama. With the exception of the first 17 rows which are for their season ticket holders, ticketing is first come first serve general admission, so we got there early. They don't open the doors until one hour before tip-off. Lou DeNeen went around to all of the Bama fans he could find and thanked us for coming. He even gave me his business card and offered to help us with tickets. The arena itself feels more like a cattle auction site than a basketball gym. It's a plain, round, poorly-lit dome with bare bones concrete concourses and large doors separating the concourse from the seating area. I will give them credit for having free guest wifi that actually works, something I wish we would do. I was surprised by how late their students arrived, but their student section was packed and they were into it most of the game, but beyond that it wasn't a very loud atmosphere. They also do this weird thing where they extend their arms and hands in unison as if they are actual bears clawing at prey, and chant "bears!" over and over. We had no issues with Baylor fans, but I have no desire to ever return to Waco. Also, I will not be making the Texas A&M trip this year. Between this game and Stephen F. Austin, I've spent enough time watching basketball in bum-you-know-what Texas for a while. Up next, it's back to the conference grind with another ranked team coming to Tuscaloosa Tuesday night. The Mi$$i$$ippi $tate bulldogs are scheduled for a 7:30 pm tipoff on the SEC Network. I should emphasize the word "scheduled." The current forecast calls for snow and freezing temperatures from Starkville to Tuscaloosa to Birmingham, and if that holds true there's a good chance this one may be re-scheduled. If the game is played and you can safely get there, please do so, we really need this one.